A Night on the Orient Express caught my eye in the book shop a couple of years back and I brought it home with every intention of reading it next but it sat there (due to no fault of its own) for ages. One of the tricky aspects of having a book blog is that the number of novels that you are asked to review seems to multiply, leaving the book you so excitedly picked out yourself sitting until you can stick it on to your never ending list. I would never complain about the fabulous books we are given to read but it does make you wonder if going into a book store yourself is ever a good idea! This novel has a host of different characters which at first were a bit difficult to keep track of. 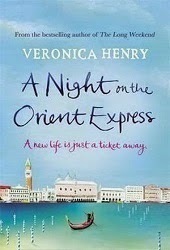 They all have their stories told and then end up on a trip together aboard the Orient Express from London en route to Venice. I almost bought my own ticket when they got on that train. I know there’s the whole romantic aspect about a train journey but for me I think I’m more fascinated in reading about the joy of living in the tiny, efficient compact spaces that defines an overnight train. As a child I remember distinctly being overly excited about the prospect of a sleeper cabin (without the luxury of the Orient Express mind you) and it brought back all that childish glee. There were some stories I was more fascinated by than others, particularly that of Riley and Sylvie who, for me, epitomized the romance of the whole journey. Their love and respect for each other, the tenderness in which they did things for each other were genuinely felt through the pages. The main characters of the novel I think were meant to be Imogen and her grandmother Adele as much more time was given to their story. I liked the depth into which we were given Adele’s history and it was delivered with such authenticity so that I felt there was truth to it. A Night on the Orient Express has a lot of different facets of and I enjoyed getting stuck in to it from the start but did find the ending wrapped up a bit too quickly for me.